The annual gift we receive from the Cincinnati International Wine Festival supports our Crayons for Kids Program. Sadly, the extent of poverty in Greater Cincinnati remains significant. According to the Annie E. Casey Foundation 2015 Kids Count Data Book, the number of children in Ohio living in poverty has increased from 19% in 2008 to 23% in 2013. The city of Cincinnati specifically has the second highest child poverty rate in the country – data from the most recent U.S. Census shows 53.1% of children in Cincinnati currently live in poverty. 48 of the 55 schools that comprise the Cincinnati Public School District (CPS) provide free or reduced lunch for their entire student body. A total of 73% of students Prekindergarten thru grade 12 in CPS, qualify for the USDA National School Lunch Program. Families unable to provide basic food and shelter inevitably struggle to secure the necessary supplies needed for their children to succeed in school. We see this on a daily basis at Crayons to Computers, as teachers take an average of over $758 worth of school supplies, incentive items, and enrichment tools to bring to their students in need each time they shop with us via our Teacher Free Store or Mobile Outreach Program. While basic school supplies are what Crayons to Computers needs the most to adequately stock our shelves, these items often do not comprise our common or consistent donations in the quantities needed to serve our constituents. This is where our Crayons for Kids Program takes over. The primary goals of Crayons for Kids are: to purchase our most needed and most used products at the lowest prices possible; and to ensure that the Crayon to Computers Teacher Free Store and Mobile Outreach Programs shelves remain stocked throughout the year with basic school supplies including items such as: paper, pencils, rulers, scissors, glue sticks and notebooks. 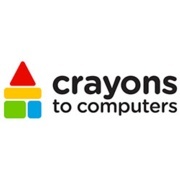 The Crayons to Computers Operations Team analyzes real-time data from our inventory management system along with feedback from teacher shoppers to determine which products we prioritize and ultimately purchase. We then negotiate the lowest possible prices for these products through wholesale and retail distributers to secure the most cost effective access to these items. Ultimately, our goal is to distribute over $12.5 million worth of school supplies throughout the 2015-16 school year, much of which will be purchased and offered to teachers via the Crayons for Kids Program. Crayons to Computers is proud to share that for each $1 donation received, we are able to purchase nearly $10 retail value worth of product.